Electrolux Flatshare Fridge | OhGizmo! Here’s a brilliant fridge concept that’s perfectly designed for the thousands of college students who’ve recently moved back to school and have to deal with unwanted roommates in order to save money. The Flatshare Fridge was created by Stefan Buchberger from the University of Applied Arts in Vienna for the annual Electrolux Design Lab competition, and it features a modular design that’s segmented into separate compartments allowing each ‘flatmate’ to have their own mini fridge. Each compartment has a tall section for bottles as well as sections for vegetables (ha!) and more importantly, frozen foods. It’s a great solution if you’re always fighting with your roommates over who bought what food, and when it comes to cleaning, you’re only responsible for your own relatively small compartment. The modular design also allows additional compartments to be stacked on top to accommodate new roommates, and the only feature I can really see missing is a locking mechanism on each door to protect your food from moochers. Whoa! looks cool to me. I've had personal experiences of sharing and losing food from the common fridge at the university hostel. The space and the size of bottles that can be kept inside looks limited and small though. Fabulous idea. I'm also surprised they didn't try to include some kind of lock though. Perhaps it would have ruined the design. It also seems to assume students will share nothing, when in reality items like milk may be used by more than one person. Still, great idea. I'm sure there's a market there. A lock would be the most important thing. Without it this concept is nothing more than a multiple compartment refrigerator. put a lock in this Electrolux and i’ll buy it! put a lock in this Electrolux and i'll buy it! I have something similar to that in my home. This fridge perfect for my kitchen since i just paint my kitchen with soft green. A lock is missing in this. 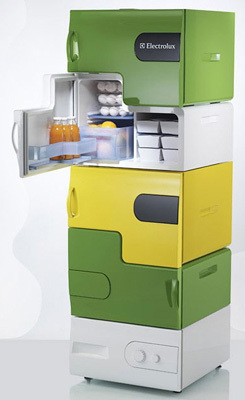 Without it this concept is nothing more than a multiple compartment refrigerator. This is a very innovative and cool design. Not just in its choice of space segmentation, but also it is choice of colors. I am very impressed by fridge. This green and yellow colour is beautiful. i loved it! Wow super cool looking refrig! I think when I have time I'm going to create one like this as well except make it out of aluminum! This is great. I can have my own private space in a fridge. Definitely a must to survive college hostel days. Maybe I should look at getting one for home too. This probably the coolest fridge I have seen. Thanks for sharing. this kind of fridge would be usefuil in japan were houses are really small. Awesome Refrigerator. Love the colors and design. Thanks for the share. Nice post! That is great for college kids who share a house. The only problem is how much is it? I wish i had this when i was in college. Would had made life easier! This is ace – it just needs a communal beer tap in my eyes…. I've had personal experiences of sharing and losing food from the common fridge at the university hostel. The space and the size of bottles that can be kept inside looks limited and small though. Whoa! looks cool to me. I've had personal experiences of sharing and losing food from the common fridge at the university hostel. It’s a really shame Electrolux haven’t pushed this more in the UK. Marketing to landlords could give them some real market peneration, other than those involved in the flatshare sector I don’t think anyone knows about this. Certainly no retail presence. At http://www.easyroommate.co.uk we’ve mentioned this on our blog, so why no marketing? I wonder how well this has been selling, because it's a great idea. Especially for my kids in college. That kind of fridge is really suitable for dormitories. It is really perfect for those independent persons who are far from their home and they can used this fridge to put their foods and beverages at ease. Great concept, perfect for offices and at work! I simply love to choose the top one because it's more easier to open and store your items.